Oh THANK YOU for Radiant! You and Radiant GENIUS! Please may be you can say about WHEN? When we will get - Oh thank you - that option? what about the internal storage format? a kickass feature would be to able to store cases as ZIP files instead of uncompressed DICOM folders. it would dramatically reduce the space required to store the images and RadiAnt could easily load them in .zip format as well. it would be the first software to do so... all the PACS viewers I know always store cases as uncompressed DICOM folders. This is very exciting news!!! I am eagerly awaiting this release. Will be posting suggestions too! Good work Radiant team! 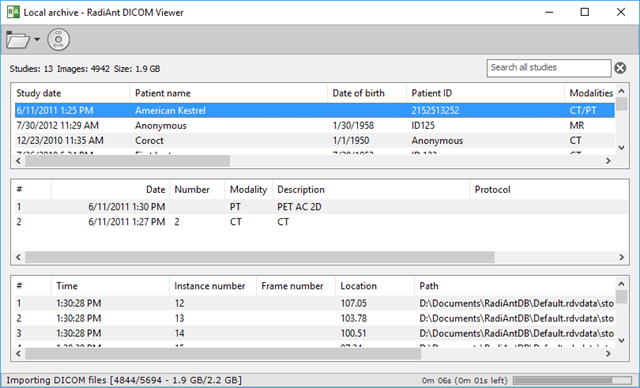 Get those servers ready, you're about to become THE dicom browser for non-mac users. I'll be certainly spreading the news at my institution. Oh thank you! I send you my email, please, I need that preview! Thank you for beta! It's brilliant! Very simple, very extremely fast! Amazing! I hope with another versions pacs files will get into the database itself. Right now it seems it can be done only manually through the imort wild folder. But Thank you very much! Amazing work! Thank you for your feedback :-) Sure, import from PACS will be added in next versions. We just wanted to share with you what we have right now - hopefully a solid basis for the local archive feature that can be built upon. Thank you very much for sharing! I think people never see so smart cool program for radiologist and surgions! Radiant - it's a very true high-quality code! With tiny size customer get Great Program surpass all overs with they codes of hundred Mb. just to let the developers and other users know that it's possible to set the RadiAnt database folder in a single network shared folder and to point multiple copies of RadiAnt on different computers to import and store cases in a single location so any imported case would be available to all computers in the network. to do so you have to change manually the DB folder into a proper network shared folders. location change can be accoplished by digiting regedit in the Start menu run field and then edit the \HKEY_CURRENT_USER\Software\RadiAnt Viewer\DBPath value in Registry. Tommy, it is technically (still) possible but can lead to the corruption of the DB. SQLite, which we use, warns against placing the db file on the network shared folders. File locks don't work well in such scenarios and this can lead to two clients writing to the file at the same time, thus corrupting it. I think we will block network folder locations for the DB to prevent this kind of issues. Maybe an option to have more than one DB location, with the ability do copy studies from one to another. shared network location would instead be a bless. why not thinking on a workaround to prevent concurrent access to the database of 2 different clients. maybe some delay of DB upload or initial copy to a local temp folders and subsequent upload and writing in the DB folders. I'm speaking again in defense of the "shared folder" DB location. while power users should be allowed keep doing it. 4- in each of those PC I will install a local RadiAnt application too whose DB location will point to the server DB folder. is this trick going to avoid simultaneous uplaod of cases and DB corruption? I think that if until the shared RadiAnt .exe is used by a client computer, it will not be available for use by another one. so they will have to wait until first user import is over. You will be able to create/open multiple databases in the next beta version. 1) It doesn't matter if you run RadiAnt.exe from a network share, or a local folder. It still runs on your local computer. 2) Even if you only watch images there are some writes to the DB file. 3) Even if only one computer uses the DB on a network share, it still can get corrupted. Great to hear about multiple databases. About Tommy's requests, I believe his intentions could be accomplished by some sort of support to DICOM query to a Radiant instance/database. So here comes my question: Do you plan to add DICOM query support to the database? You're basically asking about the PACS server functionality in RadiAnt. Yes, we plan to implement it, but at some later time, I think. Our focus right now is on the "client" features. regarding the "create/open multiple databases" what this exactly means? if RadiAnt on PC n°1 has it's own database on PC n°1 while RadiAnt on PC n°2 has a database in PC n°, will it be possible for RadiAnt on PC n°1 to view cases stored on PC n°2? each RadiAnt could work as a separate DICOM node. No, these will be still local databases. Sharing one database file between a few computers is not an option right now. You will just have the option to create new databases and open them. E.g., you can create a separate database for teaching cases, keep it on the USB and open on other computers where RadiAnt is installed. RadiAnt as a DICOM node serving studies is a more distant future. let's keep it as a local DICOM viewer with local database then. actually you have only open, an open in a new Window could be a nice feature. Tommy, different opening modes were added to the latest version (4.9.8). I like to use the stable version of Radiant very much. And today I installed the newest beta version on win 10. But when I tried to open the local archive (F8) I got the Info: "Database could not be opened". Can you help me? try make new data base, ctrl+shift+d. And I think betas of Radiant very stable. I know huge number machines with Radiant, never problems from Radiant, never. It might be because RadiAnt does not have access rights to My Documents folder where it tries to create the default DB. Please try our latest beta (4.9.27). If the same happens, press Ctrl+F8 and choose the location for your database.